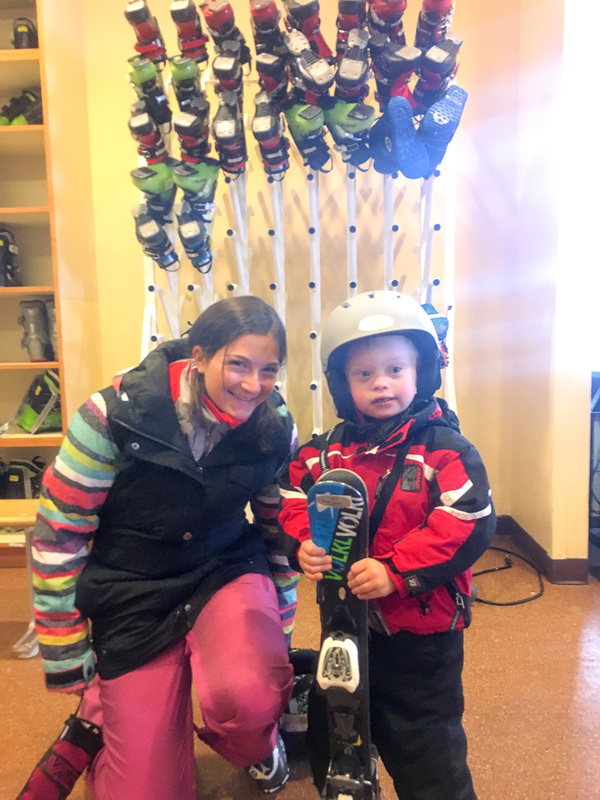 You are here: Home / Resources / Down Syndrome Resources / 8 Tips To Help A Child With Down Syndrome Ski For The First Time! 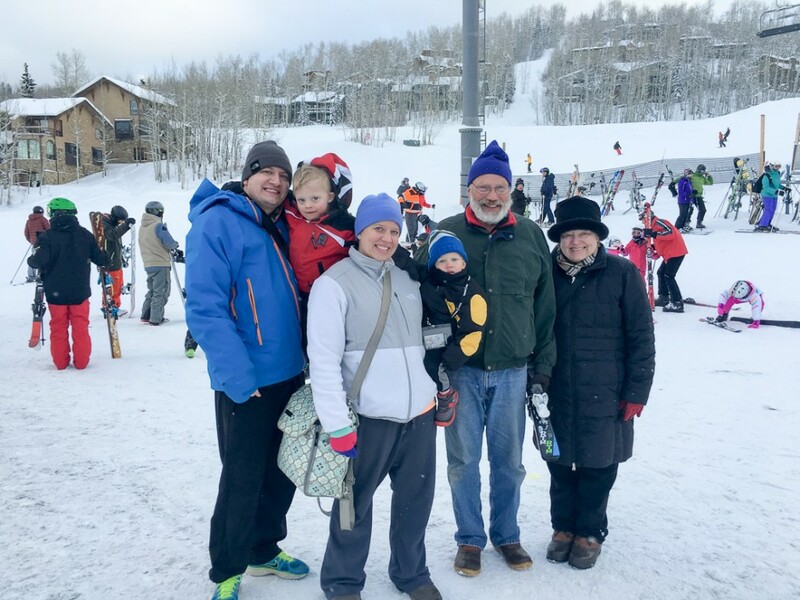 Over the Christmas holiday we took a trip to see Noah’s grandparents (who happen to live in the beautiful mountains of Colorado) and one of the things that we knew we wanted to do this year was get Noah a ski lesson! Noah loves adventures and having fun, but I didn’t know how he was going to do with skis on his feet, in the super cold weather, on top of a mountain! But he did great! I literally felt like my heart was going to explode watching him ski! Check out the video below to see for yourself. When Noah was born I dreamed about him doing things like this, and so it was a ton of fun actually seeing him get to do it! I think the thing that amazes me the most, is that Noah’s only five years old! 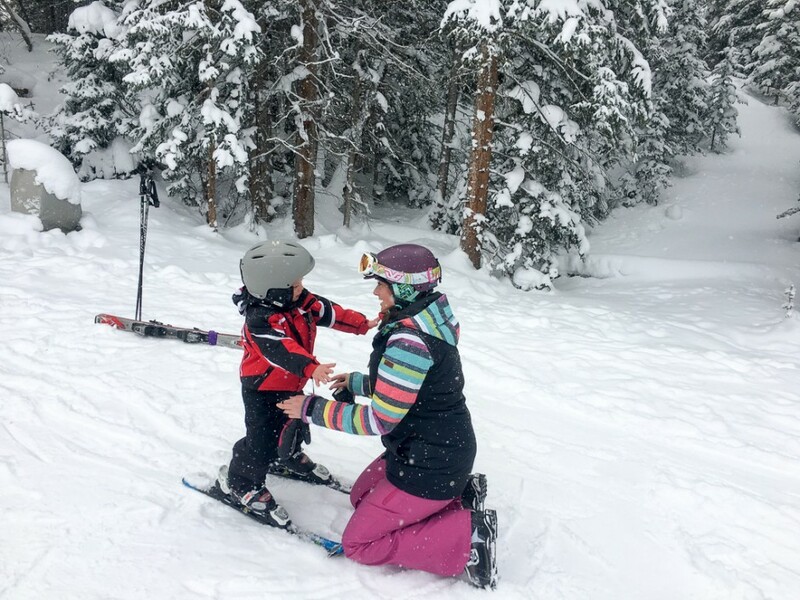 I think I would be amazed seeing any five year old learn to ski, but I would be especially amazed seeing a five year old with Down syndrome ski! Days like today remind me that having Down syndrome really is no big deal. Noah can do many of the same things any other five year old can do. He may have to work a little harder, it may take him a little longer, and he may get tired easier, but in the end he can do it! If you’re the parent of a child with Down syndrome (or another “special need”) I hope you are encouraged! I hope you remember that the sky really is the limit for our kids. And I hope you remember to celebrate all of the little milestones that your child reaches each day. I’m so proud of this little boy!!! 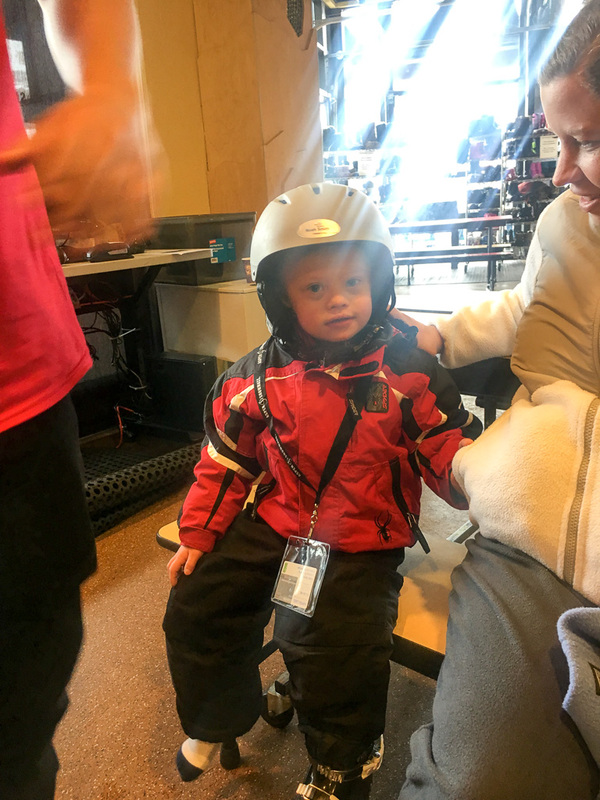 We really had no idea how Noah was going to do skiing for the first time, or what to expect. 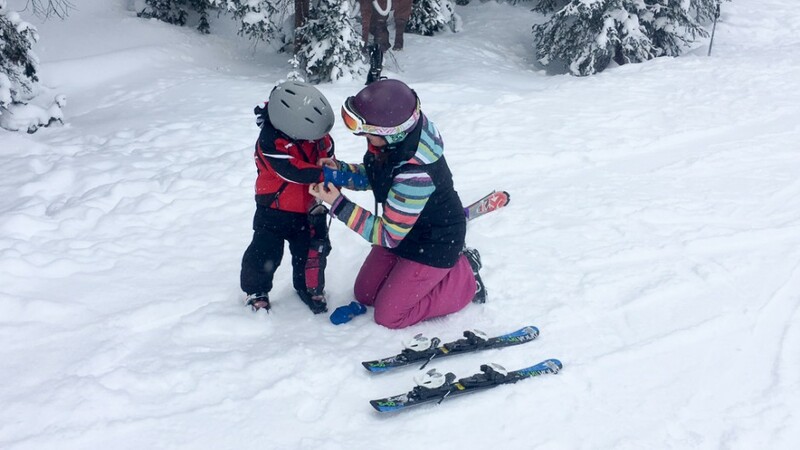 I thought I’d share a few of the lessons we learned with anyone taking their child skiing for the first time. 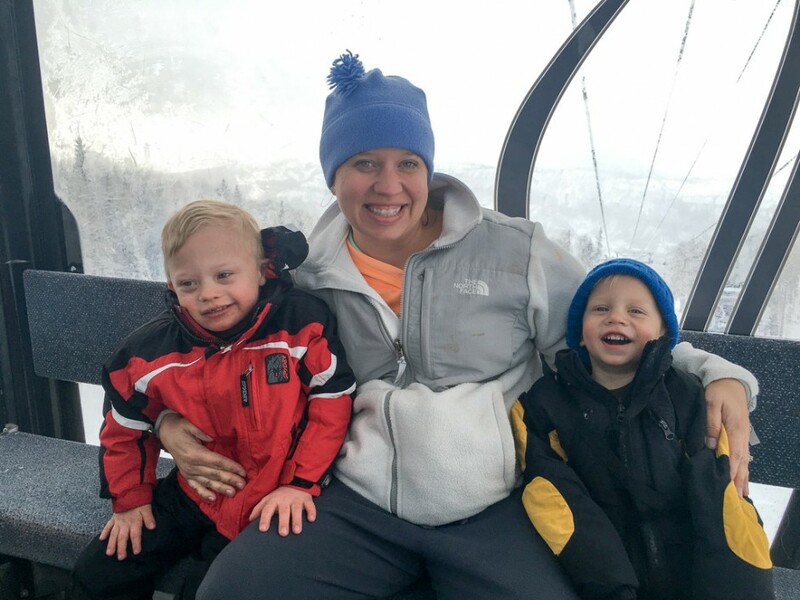 Many of these tips will apply to any young first time skier, regardless of if they have Down syndrome or not. I hope they are useful to you! Ski lessons are worth it! We thought we could just roll into town and get Noah into a ski lesson when we got there…we were wrong! Little did we know that a child has to be potty trained to go into a typical ski school for little kids. And since Noah isn’t potty trained yet (we’re working on it, but it’s a slow process) he couldn’t go into a typical kids class without a ski buddy. 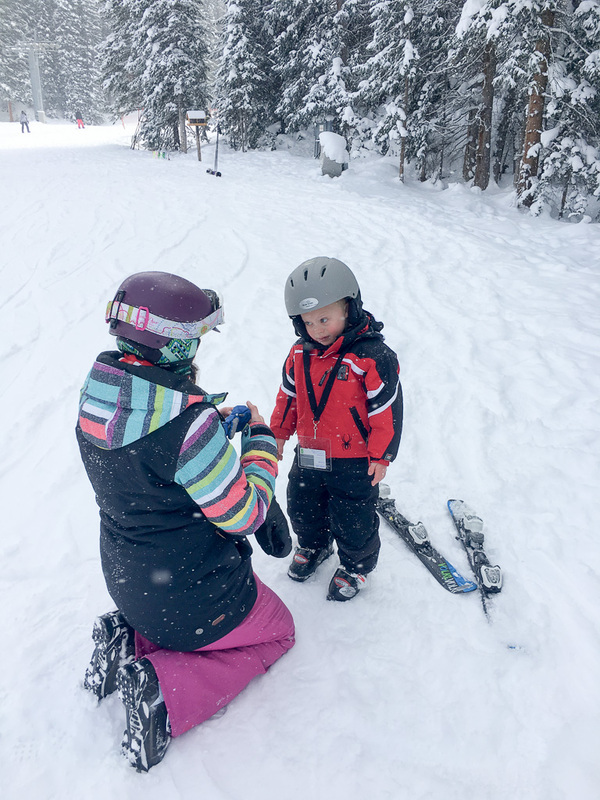 So it’s important that you call whatever ski resort you are planning on visiting in advance and asking about their programs for kids with special needs, and getting your child signed up before your trip. We didn’t know how we were going to get Noah a lesson, since we couldn’t get a buddy (and didn’t want to pay 600 dollars for a private lesson, which you can do without a buddy) but thankfully last minute a friend of ours who is a ski instructor offered to give Noah a private lesson as a gift! How awesome is that!? Don’t buy this stuff the first time! You may tempted to buy your child a lot of expensive ski gear before your ski trip, but I’d suggest going to ski store and renting your gear first, for a couple of reasons. 1. A lot of time the equipment rental is included in the price of the ski school, this is the case at any of the four Aspen owned mountains we were at. 2. Your child is going to grow, quickly. So what you buy today, may not fit next season. (Especially ski boots.) 3. 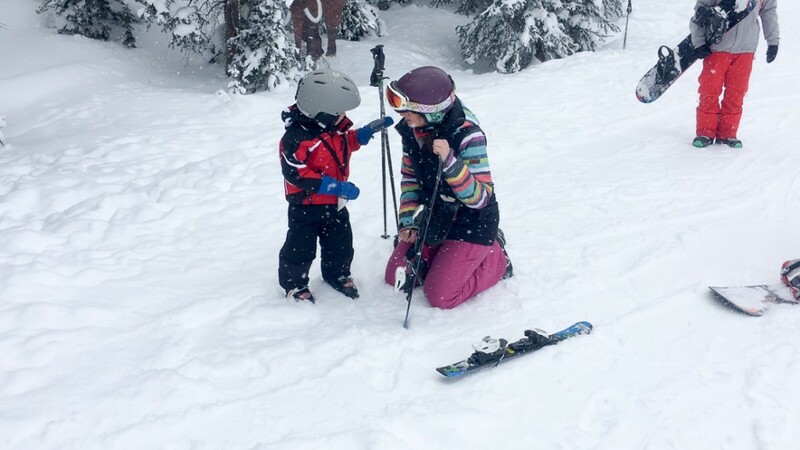 Your child may not like to ski, and then your stuck with equipment your kid will never wear. Again, all of this is personal preference, but I’d suggest renting your child’s ski gear before going out and purchasing it. 3. Get there early and let your child walk around in the equipment before their lesson. Getting fitted for ski boots! 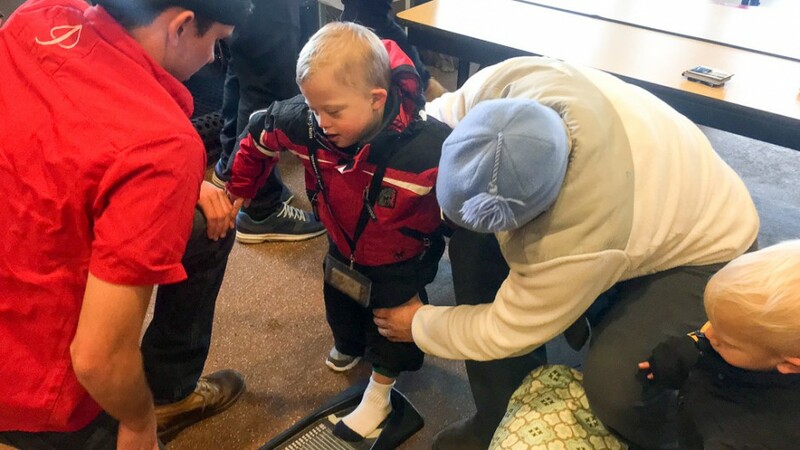 I wasn’t sure how Noah was going to react with big skis attached to his feet while skiing, but one thing I wasn’t expecting was how heavy the ski boots were, and how he’d react with those on his feet (even without the skis attached.) On the day we went skiing we pretty much got Noah suited up in his gear and headed straight to this lesson. This wasn’t a smart idea because the ski boots alone were much different than the typical shoes he wears, and he didn’t really like walking around in them. If I had a time machine I’d have gotten there an hour before his lesson, put him in his ski boots, and allowed him to walk around a bit indoors getting used to the heavier boots on his feet. On a side note, he loved learning his ski helmet! I’m pretty sure he wanted to take it home. 4. Don’t take an all day lesson. Noah likes to go, go, go..and I was planning on signing up for an all day lesson (with a lunch break) but since we ended up getting a lesson from a friend that didn’t work out, and I’m glad it didn’t. After about an hour in the super cold weather (there was also a snow storm on the day we were there) he was ready to call it a day. His face was red from the wind and cold, his nose was running, and he was done. 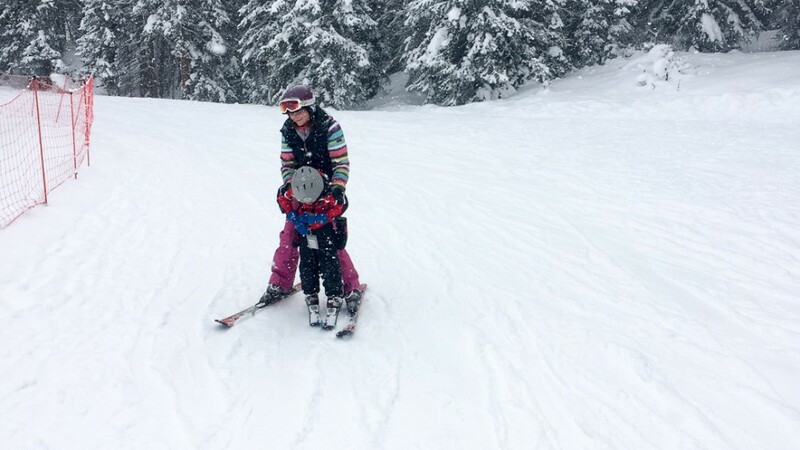 Quick note: if you enroll your child into a ski school most of them are full day, but I found out most of that day isn’t actually up on the mountain. They are inside playing, eating, etc, and typically only spend about an hour on the mountain, and the rest of that time indoors. So this type of all day lesson would be fine. Just call ahead and ask how long they will actually be out in elements. Every kid is different, and only you know how much your child can tolerate, but our child is very active and he was done after about an hour outside. 5. Find the right gloves! I actually had no idea how important the right gloves are before Noah went out on the mountain, but gloves are important! Every child’s hands are different, so you’ll want to try several on and make sure you purchase gloves that fit well and don’t come off easily. We originally bought Noah some North Face mittens last year, and they just didn’t fit very well. We picked up some Burton gloves this year after we were leaving that worked much better! We didn’t have them while he was taking his lesson, but we’ll be all set for next year! The North Face gloves didn’t fit Noah well and he kept wanting to take them off while we was learning to ski, and eventually didn’t want to wear gloves at all. When he fell down (your child will to, a lot!) and his bare hand touched the cold now, he wasn’t happy…which added to his grumpiness for the day. Having better fitting gloves would have eliminated one of Noah’s distractions for the day. In summary, don’t skimp when it comes to glove. Buy a good pair! (This is something I’d suggest buying vs renting. You’ll want to go to a ski shop in your area and try on a few pair before your trip.) The great news is, your child can wear nice gloves all the time when it’s cold outside, so these won’t be a waste of money if your child decided he / she doesn’t like skiing. You’re going to park in the wrong spot (we did). The lines are going to be longer than you thought (they were). It’s going to be colder than you thought (it was!). It’s definitely going to cost more than you thought. And your child may not like it as much as you think he /she will. It’s ok! Just be flexible and don’t let any of the unexpected ruin your day. If you go into the day expecting things to not go as planned you’ll have a much better day. See also tip #6. You’re there to have fun, so be sure fun is had! If you get frustrated or mad because things aren’t going as planned, your kids will pick up on it, and that’s not fun. 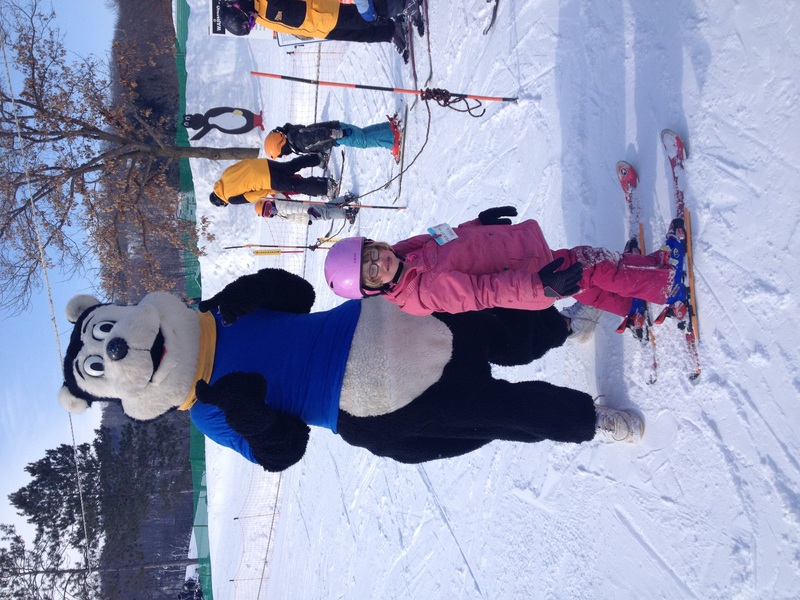 You want skiing to be a fun experience for your kids, so no matter how the day is going, it’s your job to keep it fun! So be positive, go with the flow, be flexible, and make some awesome memories! 8. Take some pictures and videos! Speaking of making some awesome memories, you’re going to want to take some pictures and videos! I don’t typically take my DSLR with me unless it’s a special occasion (like today) but I ended up not using it at all. I like to the images it takes, but it was snowing (which means the snow was getting on the lens and not taking good pictures). My hands were cold and I wanted to gloves (you can’t wear gloves when using a DSLR.) And the bag and lenses were bulky and just got in the way. I ended up taking pretty much all of my pictures and videos with my iPhone and I wish I would have just left my DSLR bag back at home. All of that to say, don’t forget to pull whatever camera you choose to use out and capture some of these memories. It will be fun sitting around the (warm) dinner table at night looking at them, and you’ll also be glad you did a few years from now! We had a blast watching Noah learn to ski. It’s fun watching his face when he “gets it.” (Make sure you watch the video above all the way to the end to see what I mean.) And it’s even more fun to watch him accomplish a huge goal like this! If you’re a new parent of a child with Down syndrome I hope this post encourages you, and remember the sky’s the limit for kids like ours! 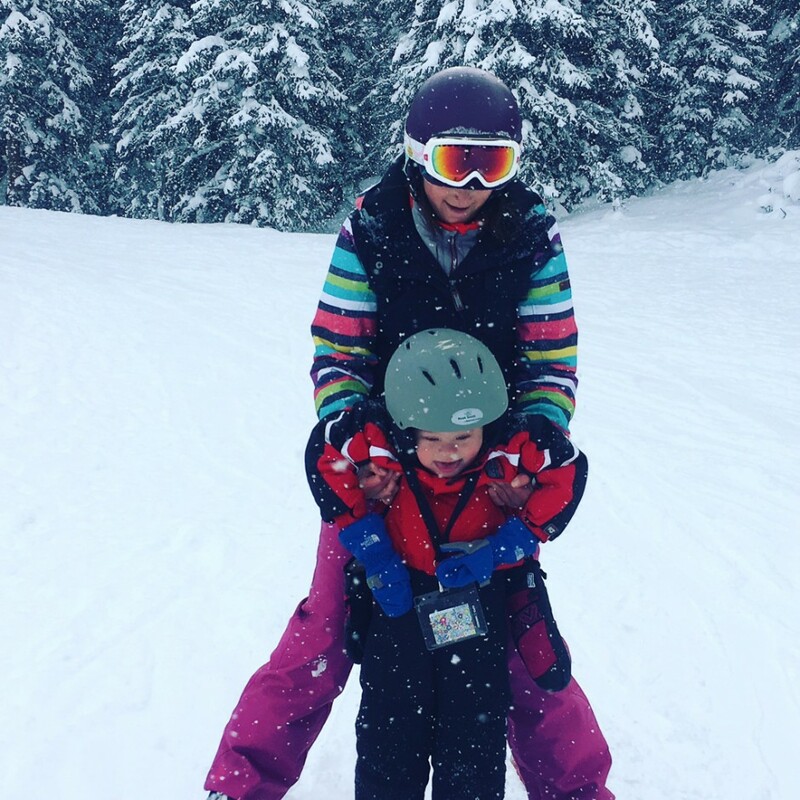 Have you taken your child with special needs to ski or snowboard, if so how was your experience? Leave a comment below and tell us about it! Or feel free just to say hi! We always enjoy hearing from you guys! My boy skis a lot, and has enjoyed tearing up the greens, blues and a few reds in France, Canada and New Zealand – it is one of the things he can do on equal terms with anyone else, and is a huge source of achievement. My only tip is … take it real slow …. and do it regularly. That’s awesome! Thanks for the comment. How old are your boys? 21 now. He started at 13. Jordan in the Canadian Rockies. Skiing at Aviemore , Scotland last year. This is our local ski resort. This is great! Go Noah! No limits! I love seeing Noah learn and grow. He’s an awesome liitle guy, such an inspiration. My little man, Xavier, just turned 2! Because of Noah and parents like you guys I know not to limit him, I know that with a little extra work and patience he will be able to accomplish much. Im so glad I found your blog soon after Xavier was born it has helped me a lot and Noah always makes me smile. May God continue bless your family. Thanks for the kind words, and shout out to Xavier! Where do you guys live? We live in Lakeland FL. We moved here a little over a year ago after X man was born to be near family. Thanks for the kind words, and for following our story! Do you have any children yourself? Thank you for sharing. You and noah stay blessed always….. I always say never underestimate a child with Down syndrome! My son at 26 never fails to surprise and amaze me! Well done Noah. Amen to that! What is your son up to these days? What does he like to do for fun? Truly awesome! I hope Noah grows up loving being on the slopes as much as possible. Not an easy thing, being a Texan, I would think. Though he has some really amazing parents who seem to provide him some wonderful opportunities to learn and grow! As a native to Buffalo, NY I grew up on the ski hills from the age of 3 and I totally admire Noah for being so brave. My family went skiing every Saturday all winter from the time I was a toddler until I joined the College ski club. It’s such a great activity that the whole family can enjoy! Have fun y’all. You are doing a great job raising Noah! This is our third year of taking our 8 year daughter Megan out skiing. She loves it, but only lasts about an hour and a half. We are still hanging out on the bunny hill. She can do the magic carpet and maneuver around by herself on and off. She needs some help with rope toes. Last year she was turning a bit and stopping. This year (like last year) she has forgotten some of what she had learned, but she is progressing. She is afraid of the noise the lift makes,. Maybe we can get out to Aspen for some gondola action. 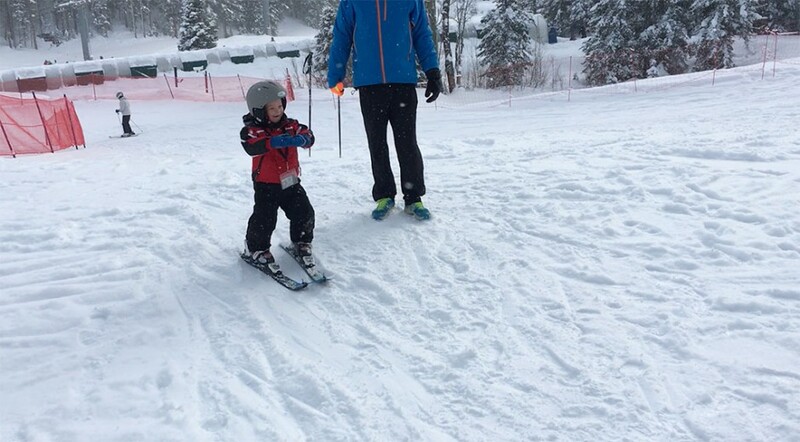 Blake skied for the first time at 5! We went to UT at Snowbasin. It was awesome for him because he had 2 ski instructors (one in front and one in back with a device that hooked onto skis to push them into a pizza wedge. They have a tiny little hill they try first. Then, they take them up on the lift. 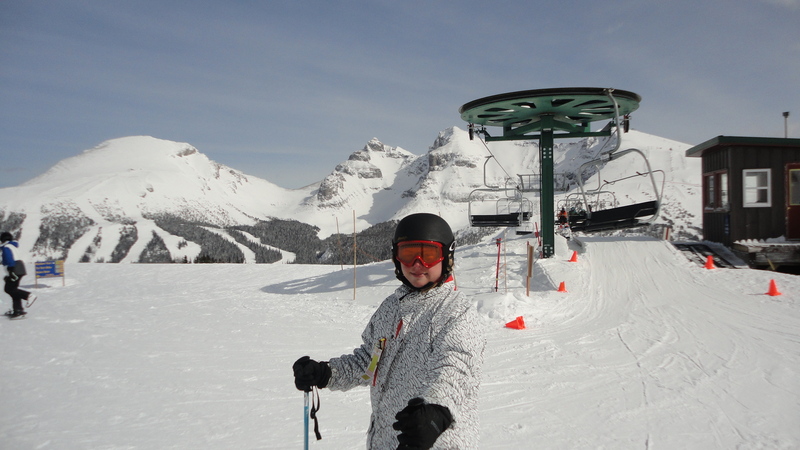 He skied down that twice and was done (tired). He loved it though! Cost was only $15 that year for skis, Lesson, boots, helmet … a non-profit in Ogden helps to make these possible and affordable!!!!! So thankful!! Also, in steamboat, they have a great adaptive program, and the child doesn’t have to be completely potty trained. He’s 11 and still working on that as well. It’s complicated.